This drum features high-quality Remo pre-tuned heads and Acousticon shells - stronger, lighter and acoustically superior to traditional wood-ply construction. 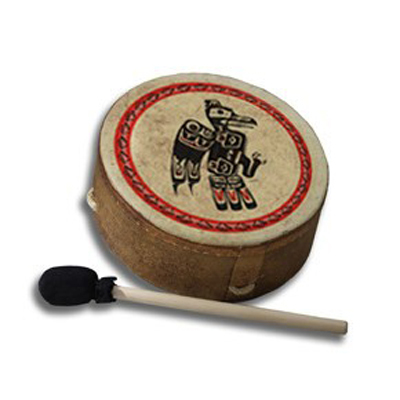 This single-head Buffalo Frame Drum currently comes in one size, with rope cross-suspension across the back and a mallet. Because these drums have synthetic heads, they can be used in any weather, being unaffected by changes in temperature and humidity; another bonus is that they are suitable for vegans, as they contain no animal products! These painted Remo Buffalo drums have been inspired by the indigenous cultures of the Americas. This drum features high-quality Remo pre-tuned heads and Acousticon shells - stronger, lighter and acoustically superior to traditional wood-ply construction.This single-head Buffalo Frame Drum currently comes in one size, with rope cross-suspension across the back and a mallet.